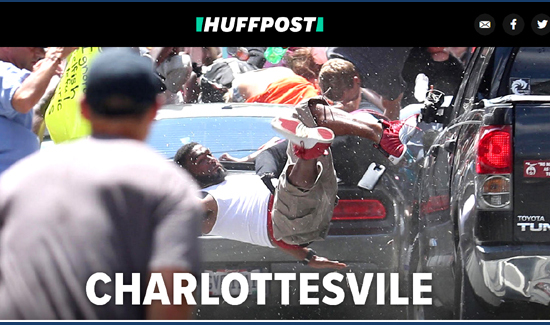 CHARLOTTESVILLE, Va. ― Thousands of white supremacists and armed militia groups faced off with counter-protesters during a violent and chaotic rally that raged for hours in this Virginia city on Saturday, resulting in the deaths of at least three people. Virginia Gov. Terry McAuliffe (D), who declared a state of emergency Saturday afternoon, condemned the violence during a press conference that evening, sending a message to the white supremacists. “Please go home and never come back. Take your hatred, and take your bigotry,” McAuliffe added. Charlottesville Police Chief Al Thomas said 35 people were treated for injuries by city personnel on Saturday, with injuries ranging from minor to life-threatening. Three people died Saturday, including a 32-year-old woman who was hit by a car that plowed into a group of counter-demonstrators and two others who perished in a helicopter crash near the protests. James Alex Fields Jr., 20, was arrested in connection with the car incident. He was charged with one count of second-degree murder, three counts of malicious wounding and one count of failing to stop at an accident resulting in a death, police Col. Martin Kumer told HuffPost. The “two others” that were killed in this incident were police officers. How could your publication not know that????? Your effort at reporting the facts surrounding this tragedy is terrible. Not sure why you even bothered…..